If your LinkedIn news feed is like mine, it’s full of trends to follow in 2018 and new year resolutions for perfecting your marketing strategies and tactics. 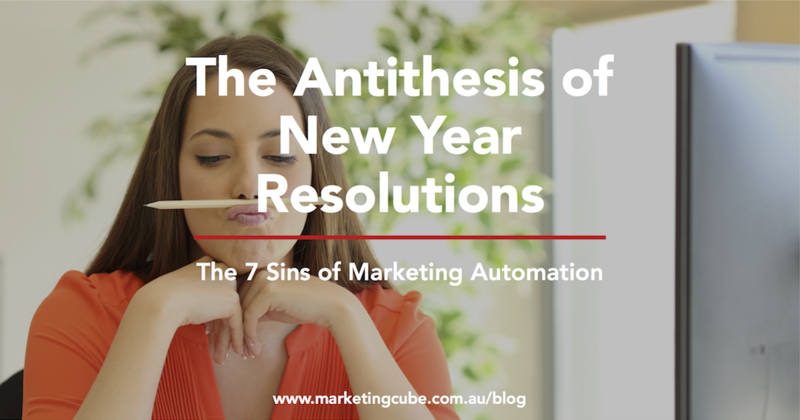 With so many things to consider and so many new technologies and trends to watch out for, I thought it timely to go back to basics and revisit some of the bad modern marketing habits I saw in 2017. 1. Building from scratch. Every time. Marketing Automation by nature is supposed to be agile and immediate. If you’re creating campaigns, emails, landing pages and segments from scratch every time, it’s time to rethink your approach. Your Marketing Automation tool should provide you with the ability to template anything, whether that be a newsletter for an email or a baseline dynamic segment. Having responsive, pre-approved templates in place will aid speed to market and provide a level of security to ensure that you haven’t missed a step along the way. While Marketing Automation is going to help you run smarter campaigns and automate responses, it’s not something you should set and forget. Even ‘Always On’ campaigns need regular review and optimisation. Make sure your Marketing Automation tool has rich reporting capabilities that will give you the insights you need to track campaign performance. From there, you can measure with a view to continuously adapting your campaigns for optimal return on investment. 3. Maintaining data in silos. Avoid silos of information. Bespoke Cloud platforms that don’t integrate with your core Marketing Automation and CRM systems will simply become a rod for your back and will be ineffective and open you up to security gaps and poor quality data. Having a single view of your customer across all the touchpoints in the life-cycle requires a robust data strategy and practical system integrations. For larger organisations, that may mean investing in a Data Management Platform. Either way, your automation partner should be able to help you with this and perform regular health-checks on your automation platform database. Have you received an email or letter that starts “Dear Valued Customer”? Doesn’t sound very valued if you can’t use their name, does it? Please don’t do this. Ever. With leads providing you with basic profile data through forms and integration with CRM data, you should always be able to personalise your messages with at least the contact’s name. And, with personalised emails generating six times higher revenue than non-personalised emails*, it makes a whole lot of business sense too. 5. Sending everyone to Sales. If you’re a B2B Marketer or you’re responsible for marketing high-value products and services, chances are you have a sales team you need to align with. With buyers now 57% through the decision making process before they’re ready to talk to your organisation*, Marketing is playing a more active role in the customer research and engagement phase of the buyer journey. Nurturing leads through this journey and scoring them based on profile and engagement criteria is key to handing over qualified opportunities to Sales. Far too often we see lead generation being pushed straight through to sales, before the lead is really ready to buy. This strategy only serves to lengthen the sales cycle and wastes Sales time on unqualified opportunities. Instead, use Marketing Automation to nurture and score leads, then only pass through the hot ones to your Sales superstars to close. 6. Ignoring Digital Body Language. Your Marketing Automation tool should track all digital touchpoints across your customer lifecycle. You should then be able to report on these to gain insight on content and campaign performance. But just as importantly, you should be able to use this behaviour to trigger additional automation activities. For example, if a contact downloads a specific piece of gated content from your site, you may also choose to send them another piece of content on the same topic, or add them to a nurture campaign about that particular topic. The proof is in the pudding. Companies that automate lead management and send new content automatically based on digital body language signals typically see a 10% increase in revenue in just 6-9 months*. But this is a fundamental shift for traditional marketers. Talk to your automation partner if you’re not doing this today. 7. Being a creep (believe me, it happens). The best Marketing Automation tools work to align Sales and Marketing by providing insight into who and when your contacts are engaging with you. This is supposed to help frame the sales conversation. For example, if a lead has been downloading content from your website about a particular topic and has been back to that page 3 times in the past week, that’s really useful information for your sales people to know so they can frame a conversation around that topic. But there’s a fine line between informed and just plain creepy. Timing and language is key. The last thing you want is your sales people picking up the phone as soon as someone hits your website and verbalising the fact they’ve seen the lead there three times that week. Providing guidelines around how to use this information to your advantage and when to follow-up post engagement will help you avoid creepy scenarios. Most organisations are trying to be smarter about the way they engage with their customers and technology now enables us to know more and do more, faster and smarter than ever before. But that doesn’t always mean we should. With marketing deadlines and sales targets to hit, it’s easy sometimes to lose sight of the individual at the end of the campaign. Someone with real emotions, conflicting priorities, and motivations. Getting it wrong can damage your brand and impact customer loyalty. Are you guilty of any of these seven sins? If so, we’d love to help. Sources: 1. Experian. 2. CEB. 3. Katapult.